Alexander Korolkow was born in Jena in 1961. He grew up bilingually – his mother worked as a German and Russian teacher, his father was an officer in the Russian armed forces. As a child and teenager, Alexander Korolkow thus lived both in Germany and in Russia. He completed his studies at University of Leipzig in 1983. Since then, he has been working as a translator and interpreter, initially in the civil service and since 1992 as a freelancer. 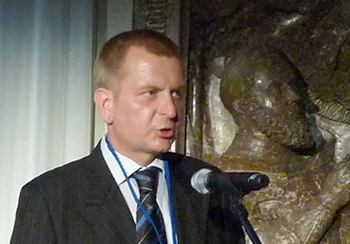 Alexander Korolkow is one of the founding members of ask@co Sprachendienst GmbH. Deutsch-Russisches Forum e.V., Petersburger Dialog e.V. Vattenfall, E.ON, Gazprom Germania, Ruhrgas etc.